Afrobeat is a music genre which involves the combination of elements of West African musical styles such as fuji music and highlife with American funk and jazz influences, with a focus on chanted vocals, complex intersecting rhythms, and percussion. The term was coined in the 1960s by Nigerian multi-instrumentalist and bandleader Fela Kuti, who is responsible for pioneering and popularizing the style both within and outside Nigeria. Distinct from Afrobeat, is Afrobeats - a sound originating in Nigeria in the 21st century, which takes in diverse influences and is an eclectic combination of rap, reggae, dancehall, and even R&B. Afrobeat began in Ghana in the early 1920s. During that time, Ghanaian musicians incorporated foreign influences like the foxtrot and calypso with Ghanaian rhythms like osibisaba (Fante). Highlife was associated with the local African aristocracy during the colonial period and was played by numerous bands including the Jazz Kings, Cape Coast Sugar Babies, and Accra Orchestra along the country's coast. Nigeria later joined the Afrobeat wave in the late 60s led by Fela Kuti who experimented with different contemporary music of the time. Upon arriving in Nigeria, Kuti also changed the name of his group to Africa '70. The new sound hailed from a club that he established called the Afrika Shrine. The band maintained a five-year residency at the Afrika Shrine from 1970 to 1975 while afrobeat thrived among Nigerian youth. Although the term Afrobeat was coined as early as 1968, after making a trip to the United States, Kuti wasn't really making music in the category of Afrobeat. The name “Afrobeat” shows the significance of groove to the music, as opposed to Afrofunk. In 1969, Kuti and his band went on a trip to the U.S. and met Sandra Smith, a singer and former Black Panther. Sandra Smith (now known as Sandra Isadore) introduced Kuti to many writings of activist such as Martin Luther King Jr., Angela Davis, Jesse Jackson, and his biggest influence of all, Malcolm X. As Kuti was interested in African American politics, Smith would inform him of current events. In return, Kuti would fill her in on African culture. Since Kuti stayed at Smith's house and was spending so much time with her, he started to re-evaluate his music. 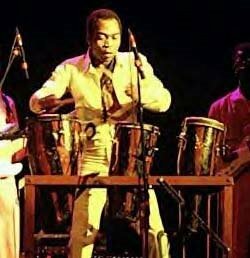 That was when Fela Kuti noticed that he was not playing African music. From that day forward, Kuti changed his sound and the message behind his music. The name was partially borne out of an attempt to distinguish Fela Kuti's music from the soul music of American artists such as James Brown. Prevalent in his and Lagbaja's music are native Nigerian harmonies and rhythms, taking different elements and combining, modernizing, and improvising upon them. Politics are essential to Afrobeat, since founder Kuti used social criticism to pave the way for social change. His message can be described as confrontational and controversial, which can be related to the political climate of most of the African countries in the 1970s, many of which were dealing with political injustice and military corruption while recovering from the transition from colonial governments to self-determination. As the genre spread throughout the African continent many bands took up the style. The recordings of these bands and their songs were rarely heard or exported outside the originating countries but many can now be found on compilation albums and CDs from specialist record shops. Akuba: a set of 3 small stick-hit Yoruba congas (play flourishes/solos, and ostinatos). Also mistakenly called "gbedu" (gbedu is the name of a large ceremonial drum), but are related to the Gbedu. Fela Kuti included the traditional Gbedu drum in his ensemble, with a percussionist pounding out a thunderous rhythm from a 2.5 metres (8.2 ft) drum lying on its side. Many jazz musicians have been attracted to Afrobeat. From Roy Ayers in the 1970s to Randy Weston in the 1990s, there have been collaborations that have resulted in albums such as Africa: Centre of the World by Roy Ayers, released on the Polydore label in 1981. In 1994 Branford Marsalis, the American jazz saxophonist, included samples of Fela's "Beast of No Nation" on his Buckshot LeFonque album. The new generation of DJs and musicians of the 2000s who have fallen in love with both Kuti's material and other rare releases have made compilations and remixes of these recordings, thus re-introducing the genre to new generations of listeners and fans of afropop and groove (see Afrobeats section below). Afrobeat has also profoundly influenced important contemporary producers and musicians like Brian Eno and David Byrne, who credit Fela Kuti as an essential influence. Both worked on Talking Heads' highly acclaimed 1980 album Remain In Light, which brought polyrhythmic afrobeat influences to Western music. The horn section of Antibalas have been guest musicians on TV On The Radio's highly acclaimed 2008 album Dear Science, as well as on British band Foals' 2008 album, Antidotes. Some Afrobeat influence can also be found in the music of Vampire Weekend and Paul Simon. In 2009 the music label Knitting Factory Records (KFR) produced the Broadway Musical FELA! As said on the musical's website, the story showcased Fela Kuti's “courage and incredible musical mastery” along with the story of his life. The show had 11 Tony nominations, receiving three for Best Costumes, Best Sound and Best Choreography. FELA! Was on Broadway for fifteen months and was produced by notables such as Shawn “Jay-Z” Carter and Will & Jada Pinkett-Smith. Many celebrities were noted on attending the shows such as, Denzel Washington, Madonna, Sting, Spike Lee (who saw it eight times), Kofi Annan, and even Michelle Obama. Michelle Williams, former singer of girl group Destiny's Child, was cast as the role of Sandra Isadore. From early in the 21st century, a new type of sound, originating in Nigeria, has become increasingly prominent in African popular music.This name echoes Afrobeat, the 1970s fusion of Jazz and traditional Nigerian and Ghanaian music which is an important influence, but Afrobeats is a largely different style. "Afrobeats is not a style, per se, like Afrobeat. It simply means the new sound of Africa, which takes in diverse influences that take inspiration from its African roots and is combined with the sounds of Rap, Reggae/Dancehall, and even R&B. It's an extremely eclectic combination that makes for quite the enjoyable sound." Afrobeats is most identifiable by its signature driving drum beat rhythms, whether electronic or instrumental. These beats harken to the stylings of a variety of traditional African drumbeats across West Africa as well as the precursory genre of Afrobeat. The beat in Afrobeats music is not just a base for the melody, but acts as a major character of the song, taking a lead role that is sometimes equal to are of greater importance than the lyrics and almost always more central than the other instrumentals. Another distinction within Afrobeats is the notably west African, specifically Nigerian or Ghanaian, accented English that is often blended with local slangs, pidgin English, as well as local Nigerian or Ghanaian languages depending on the backgrounds of the performers. DJs and producers like DJ Black, Elom Adablah, and C-Real (Cyril-Alex Gockel) for example, have been a crucial part in spreading the popularity of this form of music. Their artistic mixing of beats and sounds allow a younger audience to experience a sound that is somewhat familiar in its influences and yet uniquely African. Their mixing and promotion of popular hits on the continent is also a tried and true method for success. Often what the play in clubs, radio shows, podcasts, etc. are what become popularized both within Africa and abroad. Since 2012, Afrobeats have gained mainstream recognition outside of Africa, especially within the UK. UK hits have included "Oliver Twist" by D'banj a Nigerian which reached 9 on the UK Singles Chart in 2012, and "Million Pound Girl (Badder Than Bad)" by the Ghanaian British artist Fuse ODG, which reached 5 on the UK Singles Chart in 2014. Afrobeats nightclubs are now primary features of UK's nightlife with clubs opening in most major cities. Other mainstream popularity garnered by Afrobeat is shown in Canadian artist Drake's music. Drake's 2017 album More Life contains many Afrobeat and Dancehall influences. Afrobeats has captured the attention of many award shows as well. For example, the BET Awards usually highlights the musical genre of Afrobeats and/or other types of music by having the category “The Best International Act.” In the year 2018, the famous Nigerian afrobeats singer Davido won and when presented the award, the audience knew he was from Nigeria. When accepting his awards, Davido says, “My continent has been so blessed to influence other cultures. Let's collaborate everybody.” In this statement, Davido tried to show the audience of American celebrities that African artists would love to collab and make their mark in America. In previous years other famous artists have won the category as well, such as the singer Wizkid (Nigeria) in 2017 and in 2016 the DJ Back Coffee (South Africa) won. According to David Drake, the eclectic genre "reimagines diasporic influences and—more often than not—completely reinvents them." However, some caution against equating Afrobeats to contemporary pan-African music, in order to prevent the erasure of local musical contributions. "We are moving towards an African majority which is diverse both in its cultural habits and in its relationship to colonial and postcolonial governance, so the shift away from Caribbean dominance needs to be placed in that setting. Most of the grime folks are African kids, either the children of migrants or migrants themselves. It's not clear what Africa might mean to them"
"This movement will shed light on Africa in a positive way and focus on how we can improve Africa. It's not about just plying your talents in the Western world; it's about going back home and helping Africa." Although originally a Nigerian genre Afrobeats has grown in popularity worldwide. It first made its global debut in the United Kingdom with the surge of African immigrants, however the tunes of this genre can now be heard everywhere. Iyanya, Wizkid, Sean Tizzle, D’Banj, P-Square, and Davido serve as prime examples of Nigerian artists who have emerged in the global scale. Afrobeats’ international popularity is likely rooted in the fact that beat/melody resemble a blend of EDM, R&B, and hip-hop thus providing a familiar tune for many. Furthermore, as English is an official language of Nigeria, artists often choose to sing/rap in English, Pidgin English, and/or their local language. Afrobeats have expanded global conversation of Nigeria, which had previously been reduced to political unrest as a result of religious disputes. Afrobeats in a sense has created a platform for which the world can engage with Nigeria’s vibrant and rich culture. American artist including Michelle Williams have used Afrobeats directly in their music or have been heavily influenced by Afro beat songs. This includes William’s top hit “Say Yes,” a gospel song based on the Nigerian hymn “When Jesus Say Yes.” The song’s beats are said to resemble the popular four-beat of house music, but in fact follows the 3-2 or 2-3 of Afrobeats. This beat is known as the clave and mixes a rhythm with a normal 4/4 beat, it is commonly seen in many forms West African music. Furthermore, there have been many collaborations between performers in the West and Nigerian artists including French Montana and Ice Prince, Rick Ross and P-Square, and Kanye and D’Banj. While Afrobeats international popularity has considerably grown its primary audience continues to be Africans, especially the diasporic communities that have come as a result of education. Many Nigerian artists tour the U.K and the United States to large immigrant audiences. DJ 3k, a Nigerian-American immigrant, and his brother Dee Money have developed a large network in Chicago, and usually bring Nigerian artists to the city. They have used this as a platform to bring these performers across the United States. The variability in this genre allows for the production of a variety of songs, each one more exciting than the next. Regardless, it consistently relies on a set of heavy beats that make this music easy to dance to, which acts as a major draw for the genre. Furthermore, many major artists of Afrobeats have opted to sing in a manner that resemble those of American rap and hip hop. Furthermore, theses melodies are often occupied by opulent music videos filled with picturesque mansions, expensive cars, and other tropes familiar to American music videos. Other Nigerian artists have found inspiration in South Africa, mixing Afro-house, popular in South Africa, with Afrobeats. Artist like Patoranking have looked to the Caribbean for inspiration, particularly Jamaican dancehall. A music festival that's recognized worldwide is One Africa Music Fest. The festival has four different locations: New York City, Houston, London, and Dubai. One Africa Music Fest showcases modern Afrobeat music and talent. As stated on the official website, the main focus of the music festival is to help strengthen Africa's position in the entertainment industry on a global level. The festival also wants to create awareness to display the positive side of Africa that people don't usually know about. This Afrobeats music festival promotes collaboration between other artists, businesses and communities. Afro Beat Fest is an annual festival in Newark, New Jersey celebrating African culture including music, art, fashion, dance, crafts and cuisine. ^ Grass, Randall F. "Fela AnikulaThe Art of an Afrobeat Rebel". The Drama Review: TDR. MIT Press. 30: 131–148. ^ Stewart, Alexander (2013). "Make It Funky: Fela Kuti, James Brown and the Invention of Afrobeat". American Studies. 52: 99–118 – via Project MUSE. ^ David McDavitt (21 April 2006). ""Lead Congas" in Afrobeat". The Afrofunk Music Forum. Retrieved 30 January 2010. ^ Michael E. Veal (2000). Fela: the life & times of an African musical icon. Temple University Press. p. 3. ISBN 1-56639-765-0. ^ Brantley, Ben. "About | FELA! On Broadway". FELA! On Broadway. ^ a b Grass, Randall F. "Fela AnikulaThe Art of an Afrobeat Rebel". The Drama Review: TDR. MIT Press. 30: 131–148. doi:10.2307/1145717. JSTOR 1145717. ^ a b Hancox, D. (2012). The Rise of Afrobeats. The Guardian. ^ a b Shipley, J. W. (2013). Transnational circulation and digital fatigue in Ghana’s Azonto dance craze. American Ethnologist, 40(2), 362-381. ^ Houghton, Eddie "Stats" (2018). "How Dancehall-Inflected Is Drake's Album More Life, Really?". The Fader. Retrieved 4 February 2018. ^ Odutayo, Damilola. "'Come to Africa,' Nigerian star Davido urges as he lands BET award in LA". www.cnn.com. ^ "Pop Music's Nigerian Future". The FADER. Retrieved 30 November 2015. ^ "At the crossroads of BET, Afrobeats, and #BlackLivesMatter". Africa is a Country. Retrieved 30 November 2015. ^ a b Dan Hancox, "The rise of Afrobeats", The Guardian, 19 January 2012. ^ a b c d Dan Hancox (19 January 2015). "The rise of Afrobeats". The Guardian. Retrieved 15 May 2017. ^ Kenner, Rob (13 February 2017). "Introducing Mr Eazi, the OVO and Wizkid Favorite Bringing Afrobeats to the Masses". Complex. Retrieved 22 March 2017. ^ Robin Scher (6 August 2015). "Afrobeat(s): The Difference a Letter Makes". Huffington Post. Retrieved 15 May 2017. ^ Olusegun-Joseph, Y. (2014). Transethnic allegory: The Yoruba world, hip hop and the rhetoric of generational difference. Third Text, 28(6), 517-528. ^ Hazelann Williams (9 April 2012). "Quick Chat With... Afrikan Boy". Young Voices. Retrieved 15 May 2017. ^ a b c d e f g h i j k Lakin Starling. "10 Ghanaian Afrobeats Artists You Need To Know". The Fader. Retrieved 15 May 2017. ^ Ofulue, C. I. (2016). Language of Politics and Identity: A Sociolinguistic Study of Linguistic Practices in Nigerian Political Campaign Advertising Discourse on Social Media. Ihafa: A Journal of African Studies, 8(2), 229-261. "The (Afro) beat goes on". The Evening Standard. Archived from the original on 12 August 2013.